With Windows 10, Microsoft made it easy to quickly refresh or reset pc with just a few clicks. 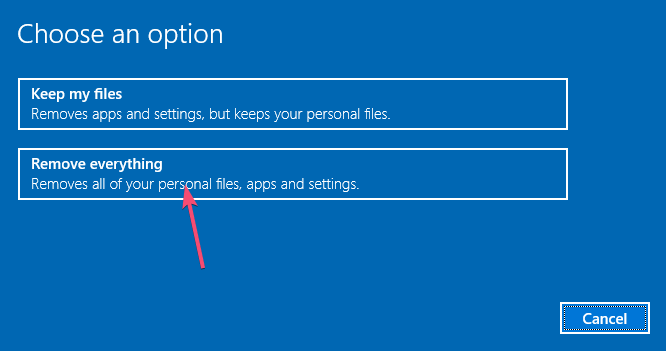 You can easily reset or refresh Windows 10 computer by opening the Settings app and going to "Update and Security -> Recovery" and pressing the "Get started" button under Reset this PC section. Alternatively, you can also reset PC from command prompt when needed. Basically, you issue a single command and Windows will start the reset process. The good thing about this approach is that you don't have to dig through menus to find the reset or refresh option. Now, you might be wondering, what is the difference between Refresh and Reset options on Windows 10. It's very simple actually. Refresh PC: When you refresh a Windows 10 PC, Windows will refresh and/or replace all system files. Refreshing a PC doesn't remove your personal files. 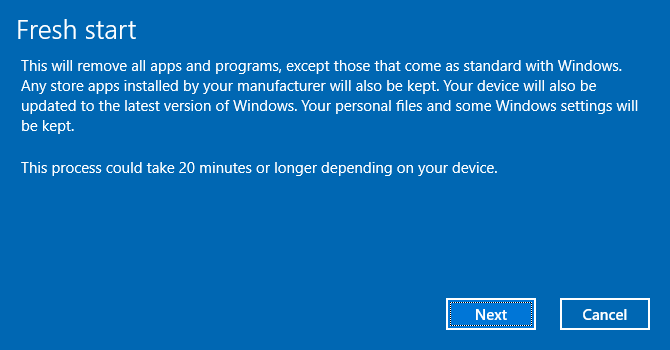 However, Windows will uninstall all applications except the ones that come pre-installed, like the built-in store apps. Reset PC: Resetting is the more aggressive version of Refresh. That is, resetting a PC removes all installed applications and your personal files located in the Windows installation drive. i.e, C drive. 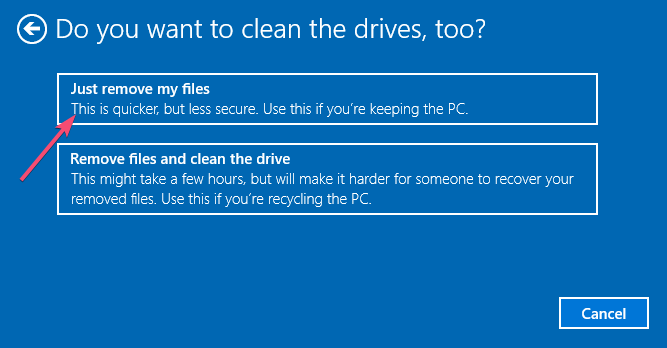 Windows will not touch your files in other drives or partitions as long as you select appropriate options. Without ado, let me show you how to reset Windows 10 PC from command prompt. The same command works in PowerShell too. Note: Before resetting or refreshing, close all the applications and backup any application settings and files. This allows you to restore them after the reset or refresh process. Right-click on the Command Prompt and select "Run as Administrator". In the command prompt window, execute the below command. Select "Remove everything" option in the prompt window. Select "Just remove my files" option. Click on the "Reset" button. 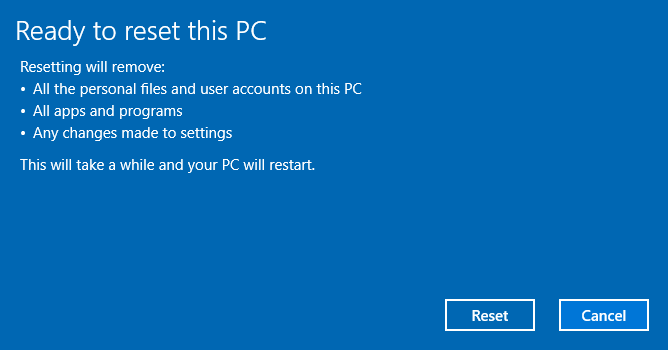 As soon as you click on the reset button, Windows will start the reset process. It takes anywhere from 20 to 30 minutes to complete the resetting procedure. So, sit back and wait. Once completed, Windows will automatically restart and you can start using it. Of crouse, you need to install all your favorite programs. 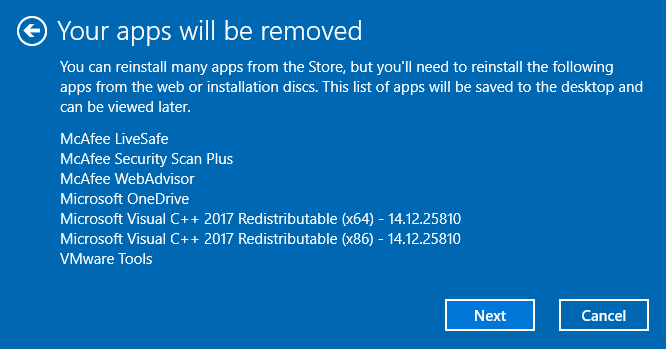 Windows will show a list of all the application it will uninstall. In my case, Windows is uninstalling McAfee and a bunch of other apps. Click on the "Next" button. Click on the "Start" button in the "Let's get started" prompt. That is it. 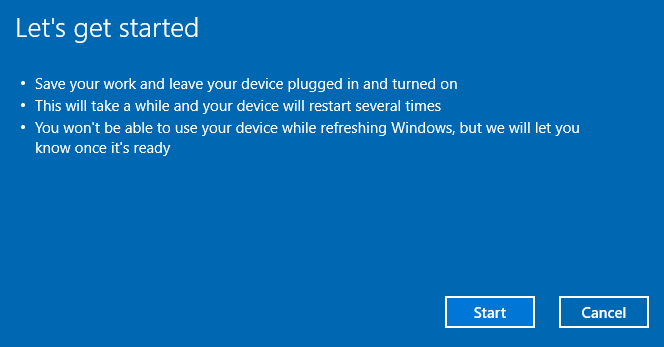 Just like with the reset option, it can take anywhere from 20 to 30 minutes to complete refreshing your Windows 10 PC. So, sit back and wait till it is complete. Once complete, your system will automatically restart. As you can see, it is rather easy to reset PC from command prompt on Windows 10. If you have any problems or questions, do comment below and I will try to help as much as possible. Also, if you like this article, you might also like to know how to change command prompt or PowerShell cursor size, color, and share and how to preview or open raw images on Windows 10. Do check them out.